At our previous house we had a huge mango tree in our back yard. It made the best mangoes each year, but also made a mess of the yard and attracted a few zillion fruit flies. 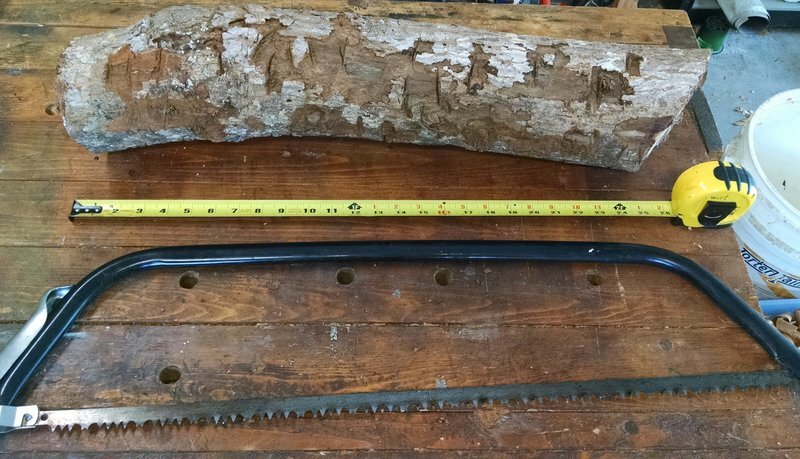 About 6 years ago I cut off a larger branch and stored away two sections of it for a rainy day. My son got a mini lathe from his Grandmother for Christmas this year. He was enjoying it so I thought he might have fun if I got out the bungee lathe and we made something together. 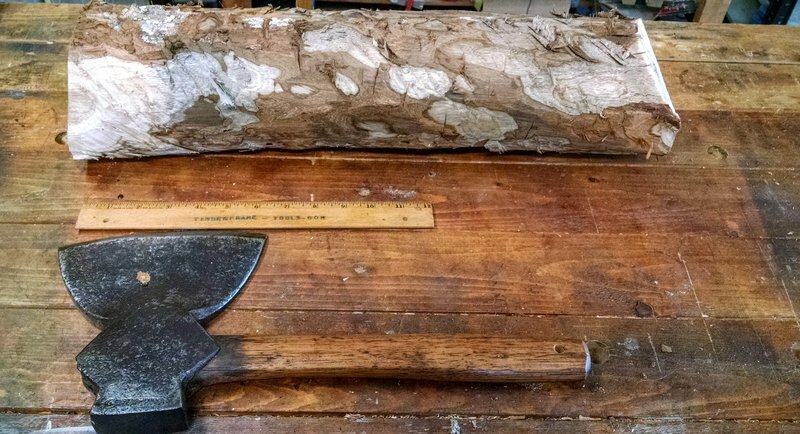 So I decided it might be fun to try to turn one of those sections of mango limb into a pair of father and son carver’s mallets. First I removed most of the bark with a hewing hatchet. The the real work started. Mango itself is quite hard and has a bit of interlocking grain, which should make it good for use in a mallet. However, one of the ends of the log had some rot in it. Not a lot, but right in the center where it is supposed to be held to the spindle of the lathe. When the spindle wobbles and gets enlarged on the piece of wood, it eventually falls off. You will see in the video a couple of times where the log falls due to the punky wood. I had to keep cutting it. After a few times I finally had it cut back far enough to where the punky wood was gone and I had a solid center in the wood. Here is a greatly sped up version. On a log this diameter it is pretty slow going because you only get about 1 revolution per pump of the treadle. The goal is to make one section much deeper to have a smaller diameter that the power cord can wrap around. Once that happens, then it progresses more rapidly. The video lasts about 8 minutes on 50x speed, so that means I had just under 8 hours into it total. Its a bit of work, but also a bit of fun. The heads had a couple of borer bug trails in them so I filled them with 5 minute epoxy and then spun on 2 coats and sanded them back to wood with the epoxy just filling in some of the voids. Hopefully that will make the head a little more durable too. When all was sanded smooth I spun on 2 coats of Boiled Linseed Oil then a few layers of Shellac & Mineral Oil. 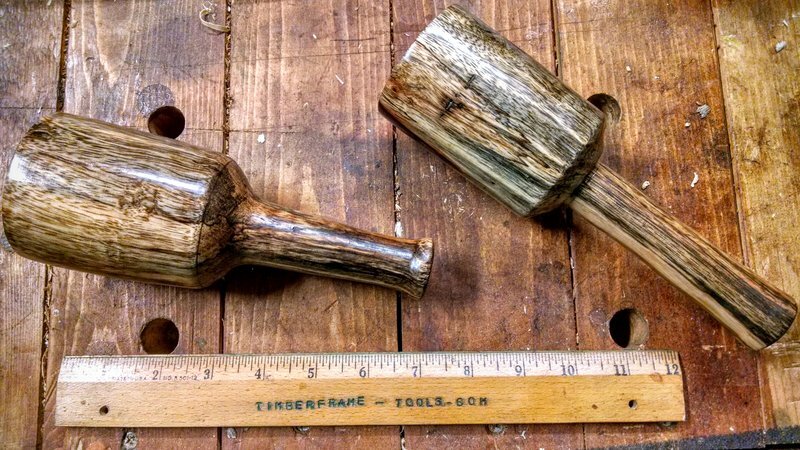 In the end we have a pair of solid carving mallets. They feel pretty nice in the hand and seem to work well in some limited testing with a couple of chisels. I made them with slightly different shapes. My son claimed the more curvy one on the left.